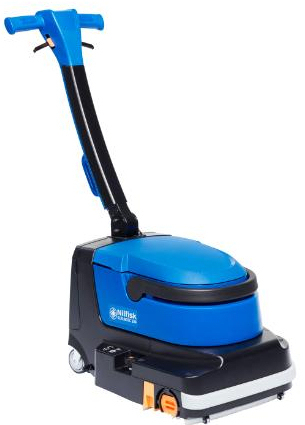 DThe SCRUBTEC 334 is a compact scrubber dryer for fast and effective cleaning of hard floors, which will take you into every corner and ensure efficient cleaning in both directions - also under furniture and shelves. You will get a light and productive machine with a low sound level suited for daytime cleaning as it is battery-driven. An attractive choice for gas stations, fast food chains, automotive, etc. Productivity is high due to the sheer speed of the machine as it is sweeping, scrubbing and drying at the same time, moving both forward and backward. Debris, dirt and even the smallest dust particles are removed effectively by the 34 cm cylindrical brush. For more in-depth cleaning without sweeping feature a microfiber roller can be used as option.